I struggle with being the mother of teenagers. Nobody is more surprised by this fact than I am. I was one of those young moms who truly disliked it when older women said things like, "Just you wait until they're teenagers. You won't think it's so fun then." In all honesty, I thought these years would be perfectly golden, because I wasn't like those other moms. I had a positive attitude. I was well-connected to my children. And, pretty much, my kids were awesome. They still are. I am daily awed by them. But man, parenting teenagers is very hard work. The sticky peanut-butter-and-jelly-kisses moments don't really happen when they start to tower over me. So anxious some days that it takes my breath away, I am ever aware of how intense this time of life is for them, how much potential there is for hurt. I struggle and I am discouraged. Some days, though, grace grants me moments just like those I imagined when I wiped jelly from his sweet cheeks. He bends intently over the making of a Valentine, reminding me so much of his father at that age that tears spring unbidden to my eyes. Could it have been thirty years ago? I blink the tears away because the boy-man before me now is asking me which color marker to use, drawing me into his world, sharing with me the work of his hands, and literally, the pieces of his heart. Such a good heart. Thank you, God. 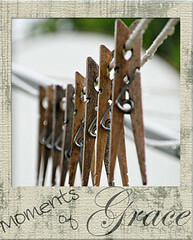 I'm sharing grace notes with the women of Suscipio this week. Won't you join us there?